TO MEET THE REQUIREMENTS OF "SOLD SECURE" THIS ALARM SYSTEM MUST BE INSTALLED AS DESCRIBED IN THIS DOCUMENT. IF YOU ARE INSTALLING THIS TO MEET AN INSURANCE COMPANY’S REQUIREMENT FOR A SOLD SECURE APPROVED ALARM, PLEASE NOTE THAT INADEQUATE INSTALLATION MAY CAUSE YOUR INSURANCE TO BECOME NULL & VOID. Control box – with internal re-chargeable battery and 12 way flying lead with terminal block. The control box can be unplugged after installation for testing/fault finding. The control box must be mounted where a thief cannot easily get to it. Suitable locations could be behind ovens or ‘fridges, if in doubt either consult Sold Secure or purchase the safe box from Keen Electronics and mount the control box in the safe. Splash proof siren – this must be mounted where a thief cannot easily get to it. It is normally convenient to mount it close to the control box - over grille in the floor, so the sound can get out and be heard outside the van When mounting over a hole in the floor ensure that the siren is a good fit, so that all of the sound goes through the floor and outside. (It’s no good making a lot of noise in the bed box!!) If the control box is fitted in our safe box the siren will also mount in this box which has a suitable hole to allow the sound out. PIR head - that should be fitted at eye level "looking down" the caravan’s interior. Avoid fitting where it "looks" straight at a window where possible. Ensure that the 12Volt leisure battery is disconnected, the mains hook up is disconnected and the 12S plug is not plugged into a tow vehicle (or test box). Once it’s location has been decided screw the unit to the caravan floor or panel. Screw the terminal block to the caravan floor or panel so that the 12 way flying lead can be connected neatly between it and the socket on the control box. Remove the mounting bracket fixing screws, and then screw the mounting bracket in the desired position. Re-fit the siren body into it’s mounting bracket and re-fit the fixing screws, ensure these are reasonably tight. Use the 2 way terminal block to connect the siren wires to the wires going to the control box. Fix the terminal block to the caravan with a single screw. This should be mounted at eye level "looking down" the caravan. Usual mounting positions are at the front of the caravan, on either side or in the centre. Avoid mounting the PIR head where it is directly facing a window. Remove the front half of the case by undoing the single screw, then carefully hinging it down and off. Carefully remove the printed circuit board, which is secured by one screw. The PIR head is mounted using the pre-drilled holes in the base. Re-fit the printed circuit board, and then connect the three wires from the control box as shown on the wiring diagram. Refit the front half of the case and secure it with the single fixing screw. This should be fitted to a rear steady with the magnet fixed to the "in board" end of the spindle and the bracket assembly mounted adjacent to it. 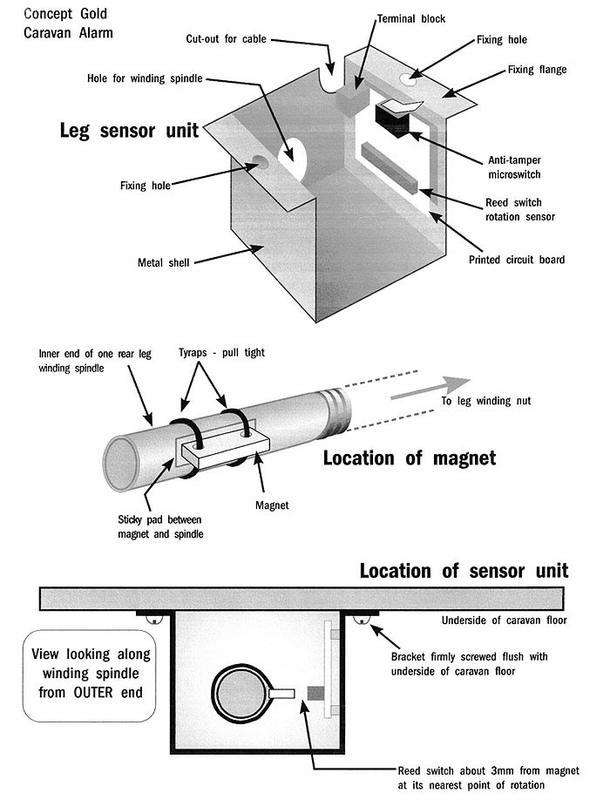 Rotation of the leg winder should cause the magnet to pass within a couple of milli metres of the sensor fitted to the bracket. Please refer to the diagram. Clean any grease off the spindle then stick a double-sided sticky pad onto the magnet, place the magnet onto the spindle then fix in place with the two tyraps. Tighten the tyraps with a pair of pliers - pull hard! Then cut off the surplus plastic from the tyraps. IMPORTANT NOTE – on some caravans the spindle may not be long enough to fasten the magnet onto. In these cases use the grey plastic tube as an extension tube. Simply tap onto the metal spindle using a hammer. Then fix the magnet to the grey tube as described above. Mount the bracket onto the underside of the caravan floor, positioned so that the magnet passes within a couple of milli metres of the sensor fitted to the bracket. Use the hole in the inboard end of the bracket as a guide for the spindle to just enter. Finally, connect the two wires from the control box to the two used terminals on the leg sensor. 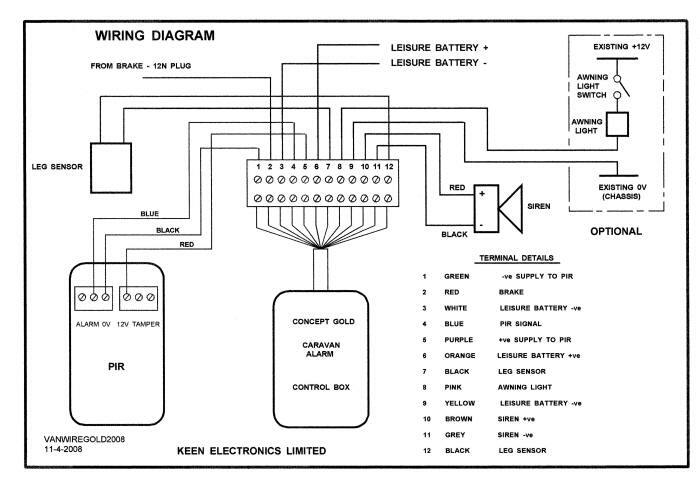 Connect the PIR head to the control box using the 4-core cable supplied in the kit as shown in the wiring diagram. Locate a convenient point in the 12N wiring to connect to the BRAKE wire - usually red in colour. Now turn the key switch clockwise, the siren should "cheep" once. Disconnecting the leisure battery - NOTE that the leisure battery must have been connected for at least 4 hours so it can charge the back up battery in the alarm. IMPORTANT NOTE –once the alarm has been triggered the red LED on the control box will stop flashing regularly and will flash a certain number of times, pause, flash the same number of times, etc. The Alarm Status table printed on the control box details number of flashes for each sensor. The LED will continue flashing until the alarm has been reset with the key switch. The LED will revert to normal regular flashing when the alarm is next turned ON. Turning the alarm OFF will then stop the LED flashing. This feature is useful to advise the owners if the alarm has been triggered in their absence and for fault finding (especially intermittent false alarms). WHEN TESTING THE ALARM’S 12N PLUG OPERATION PLEASE NOTE THAT THE VAN MUST BE COUPLED TO THE TOW VEHICLE (That is, the tow head of the caravan must be on the tow ball of the tow car). IMPORTANT NOTE – if the caravan is fitted with a stabiliser using fibre pads an electrical connection will not be made through the tow ball. This will prevent the alarm from being triggered when the 12N plug is inserted. The alarm will however be triggered when the 12S plug is inserted (as well as the 12N plug). A way round this problem is to insert some conductive metal gauze (wire wool scouring pad) into the cup of the tow head. Should a thief hitch up a connection should be made through the metal gauze.